For our house we choose the best, that is the reason we have chosen the KOFINAS company, for the professionalism, the quality and the credibility of all. The company delivered the house in an incomplete stage and with their help we accomplished it easily within a very sort period. The costs for the completion of the house were unexpected less than the costs that company gave us, saving finally and unhoped a very important amount! 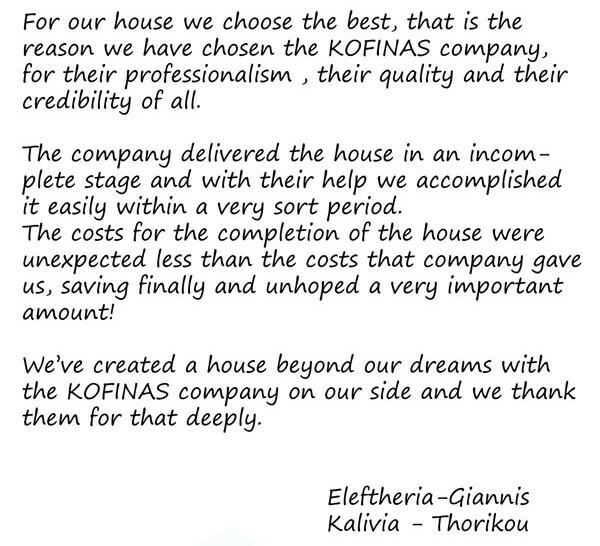 We’ ve created a house beyond our dreams with the KOFINAS company on our side and we thank them for that deeply.